FINCA is expanding its presence in rural areas of the Democratic Republic of the Congo by creating a network of banking agents. These agents, who operate from neighborhood shops, provide clients with convenient access to their FINCA accounts, making it easy for them to pay off their loans or to make small, regular savings deposits. 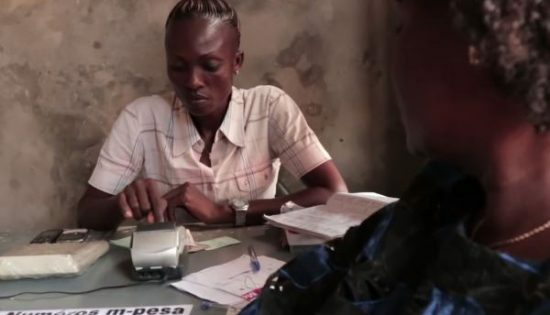 A recent study from DR Congo shows that these banking agents can also play a critical role in reaching women—especially poor women. In celebration of International Women’s Day, we are sharing top-line findings from the study to promote the critical importance of expanding financial inclusion for women. Supported by Elan/RDC, FINCA has been building-out its agent network in Kongo Central and Likasi, with the aim of delivering voluntary savings services in rural communities. As part of a baseline impact study, we interviewed almost 900 customers of the Elan-funded agents, to understand who is using the service, how they are using it, and why. We found that the women who are using FINCA’s rural banking agents have a unique profile. For one thing, most of these clients are single—even though their average age is 37—while most male clients (and most adults nationwide) are married. 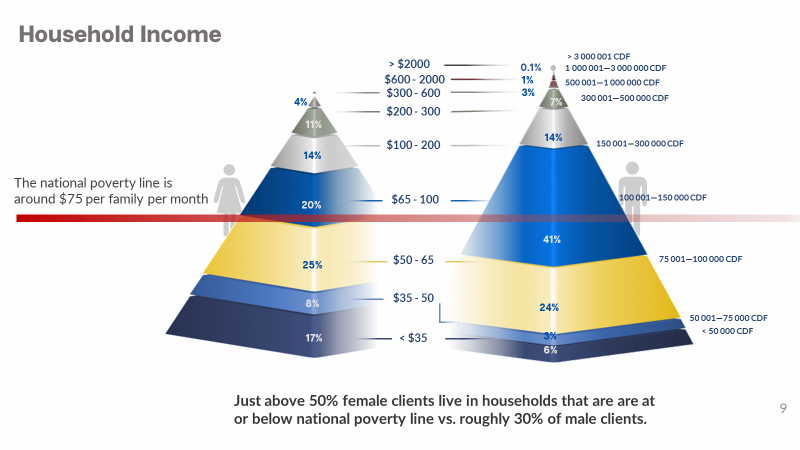 Female clients are also more likely to live in poor households: about half are below the national poverty line of US$75 per month, versus a third of men. These women are also more likely to be self-employed business owners, usually traders. 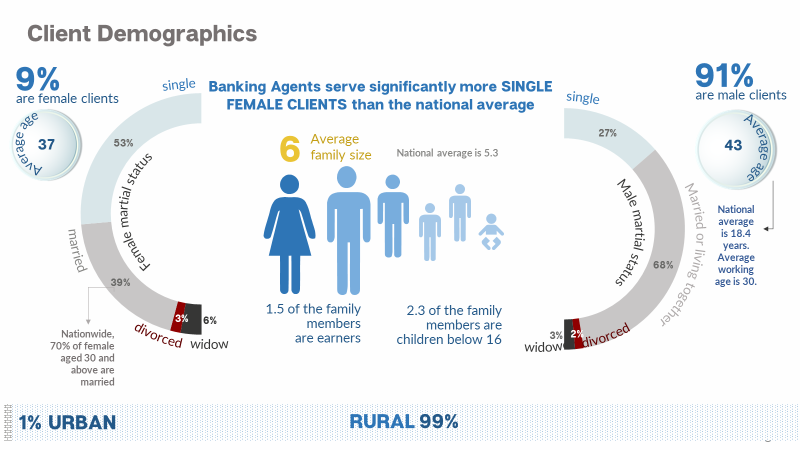 The implications for FINCA’s mission are clear: agency banking services can reach rural women while driving outreach towards those who need it the most. Putting service points near women isn’t enough, however: we must offer them the right services for their needs, which can be quite different from men. Nine out of ten women are using a simple transactional account (Falanga) to accumulate savings. With no minimum balance or fees, the Falanga is ideal for women who want to accumulate savings through small, regular deposits. We found that these accounts have the highest transaction volume (1.4 per month) and even a slightly higher balance than the salary accounts used by civil servants. The transaction volume, however, is considerably lower: US$20 per month versus US$60 for the salary accounts. It is not surprising to find that women are using banking agents to accumulate small savings, because they are more likely than men to have saved even before coming to FINCA. Over two-thirds of women who join FINCA have already had some prior experience saving, normally in an informal association known as a tontin, versus half of men. For women especially, the transition from informal to formal savings services represents an important change in motivation. When asked why they participated in the savings group, 52 percent of women cited social factors versus 20 percent who joined to save money. For most of these women, FINCA Falanga is their first formal savings account, and they open it with very specific savings goals in mind, usually to grow their business, but also to invest in household assets, education, or to pay for special events. Helping women achieve those goals is the very essence of FINCA’s mission, and a big reason why we will continue expanding a network of banking agents that allow us to reach them.